DESCRIPTION: Up to 8mm. 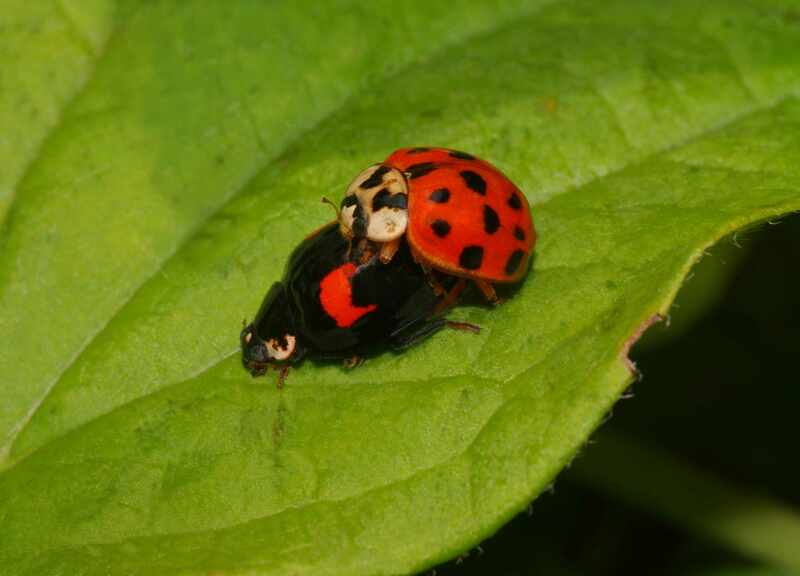 Also known as the Multicoloured Asian Ladybird and the Halloween Ladybird this variable insect is the scourge of Britain's indigenous species and is now the most common species of ladybird on the continent. The species comes in a variety of forms these being - f. succinea which has an orange-red elytra with 15 to 21 black spots, f. spectabilis with a black elytra and 4 red spots and f. conspicua which again has a black elytra and two red spots with two smaller black spots inside (note that there is variation within these forms). The pronotum is white or cream with up to 5 spots or fused lateral spots forming 2 curved lines appearing as a M-shaped mark or solid trapezoid. The species always has reddish-brown legs and are brown on the underside of the abdomen, even in the melanic colour forms. BEHAVIOUR: Has a wide feeding habit with aphids, scale insects, the eggs and larvae of various lepidoptera, ladybirds, pollen, nectar, and sugary fluids, including honeydew. Perhaps one of the reasons the species is so successful is the fact that a single female can lay over a thousand eggs in her lifetime. The species becomes dormant in cooler months and can be found congregated in sunlit spots or warm crevices. DISTRIBUTION: Common throughout in Britain and becoming more dense. HABITAT: Ubiquitous but most commonly found on deciduous trees such as Lime, Sycamore and Maple. Gardens, coniferous woodland, nettle beds and hedgerows are also places to find this common species. PERIOD: On the wing spring to summer but can be found anytime of the year.